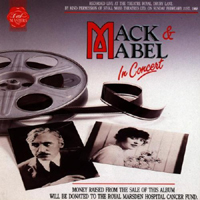 London Concert Cast, 1988 (First Night) (2 / 5) This live recording of a concert of songs from Mack & Mabel has George Hearn and Denis Quilley lending their big voices to Mack’s songs, Debbie Shapiro Gravitte walloping the daylights out of “Big Time” and “Wherever He Ain’t,” Georgia Brown’s eccentric but touching version of “Time Heals Everything,” and Tommy Tune’s ebullient “Tap Your Troubles Away.” Debits include the replacement of “My Heart Leaps Up,” Mack’s tribute to the Keystone Kops, with the inferior “Hit ‘Em on the Head.” Jerry Herman narrates. — D.B. 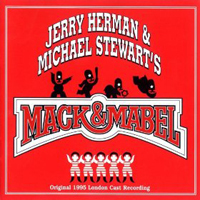 Original London Cast, 1995 (Angel) (3 / 5) Although the leads are not ideal, this recording contains plenty of material not found on the Broadway album, including both act finales, an entr’acte, some reprises, and a title song that uses the melody of “Look What Happened to Mabel.” Howard McGillin is vocally overqualified as Mack; in “I Won’t Send Roses,” he laments the lack of romance in his soul in a voice that throbs with feeling. 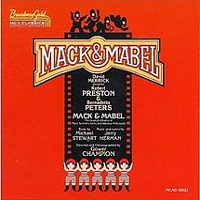 Caroline O’Connor as Mabel sounds eerily like Bernadette Peters (or an impersonator of her). Still, McGillin makes a very good case for “Hit ‘Em on the Head,” and O’Connor is appealing throughout. Kathryn Evans provides lusty renditions of “Big Time” and “Tap Your Troubles Away.” And, if anything, Larry Blank’s revisions of Philip ]. Lang’s orchestrations improve upon the originals. — D.B.